Massive flooding has affected the states of Uttarakhand, Odisha, West Bengal, Maharashtra, and severely Kerala. 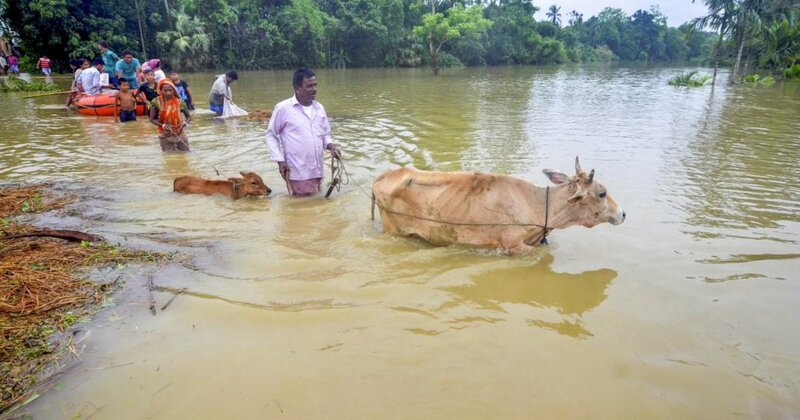 Monsoon rains continue to batter many districts of Kerala and border areas of Karnataka, Tamil Nadu, Andhra Pradesh. Goonj under its RAHAT initiative is providing immediate dignified relief with essentials to the affected families. Initial target is to reach out to over 20,000 families in the next few months which will increase as we grow here and as we gather resources. Torrential rains have triggered flash floods and landslides, wreaking havoc in states. The situation worsened as many were left homeless and roads were washed away in many parts of the states. The flood disrupted communication links as the routes damaged or blocked by debris, isolating villagers. Furthermore, tough terrain, socio-political scenario make implementation challenging for the ground team and thus, increasing the operational costs. Although networks cannot cover the entire area, but as the floods hit various states, extended network of partners, donors, stakeholders, etc activates, masses are encouraged and contributions goes for relief operations. In these tumultuous times, our biggest need is to purchase some specific items like tarpaulins, dry ration(rice, pulses, spices, sugar, tea, rava), blankets, torches, solar lanterns, mosquito nets etc. which don't come in bulk from general masses. That's where money is needed. With the large pipeline of networks and set-ups, goonj is able to reach out to affected areas at the earliest with cost effective means. The long term impact is through the rehabilitation program. As the affected people repair the damaged infrastructure, making them understand their needs and available solutions. People do not only participate in the activities but they are also rewarded by Goonj's Family kits with items for their basic needs as a reward and motivational tool.